As you probably know by now, I just love a good keyboard shortcut. This week I've got a few new ones for you--but first I'll solve The Case of the Mysterious Waking Laptop. My buddy Doug had a problem with his laptop: After putting it to sleep (into Standby mode), he'd come back a while later to find it wide awake. There are countless culprits for this kind of behavior: an accidental swipe of the mouse, a scheduled system task, and any number of other weird settings that reside in Windows' power options. Doug spent considerable time poring through those options, trying to pin down the system's insomia, but none of the sleep or hibernate settings seemed to remedy the situation. Right-click the adapter name and choose Properties. 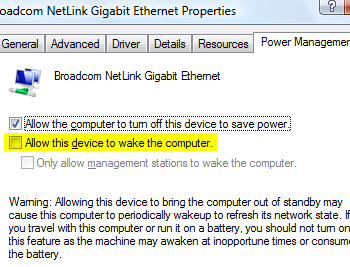 Click the Power Management tab, then clear the checkbox next to "Allow this device to wake the computer." That may or may not solve your problem, but it definitely did the trick for Doug. As it turned out, any kind of Internet access--either inbound or outbound--was causing the system to wake from Standby mode. But by disabling the Ethernet adapter's support for that capability, the system should stay asleep. Did you know you can use Windows 7's cool Aero Snap feature to simplify file management? Just open two instances of Windows Explorer, then place them side by side by dragging the windows to opposite edges of the screen. Even better, you can use keyboard shortcuts to do this. Instead of dragging each window to a screen edge, waiting for it to half-maximize, letting go the mouse button, and repeating with the other window, all you need is the Windows key. In Outlook: While in Mail view, a tap of the End key jumps you to the bottom of your Folders list, Inbox, or individual message (depending on which pane is selected). Tapping Home jumps you back up top. In Word: I'd wager Home and End were created with word processors in mind, as most such programs--including Word, of course--make valuable use of them. Tapping End moves your cursor to the end of a line, while Home moves it to the beginning. Ctrl-Home and Ctrl-End, meanwhile, jump you to the top and bottom of your document, respectively. In Your Web Browser: Borrowing from word processors, Web browsers use Home and End to jump to the top and bottom of a Web page. The only difference: no Ctrl key required. For example, like many folks, I spend a considerable amount of time using Microsoft Word. And I thought I knew all the best shortcuts, like using the Home and End keys to jump my cursor around a document, and, of course, the venerable cut/copy/paste commands. But here's one more great pair of shortcuts for folks who prefer to keep their fingers on their keys and off their mouse: Alt-Shift-Up Arrow and Alt-Shift-Down Arrow.